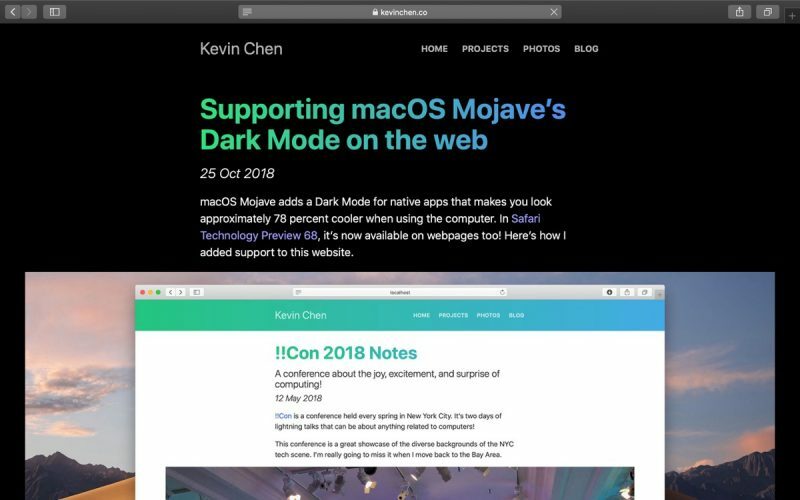 In the next official update to macOS Mojave, Apple's Safari browser will enable automatic Dark Mode for websites that support it. 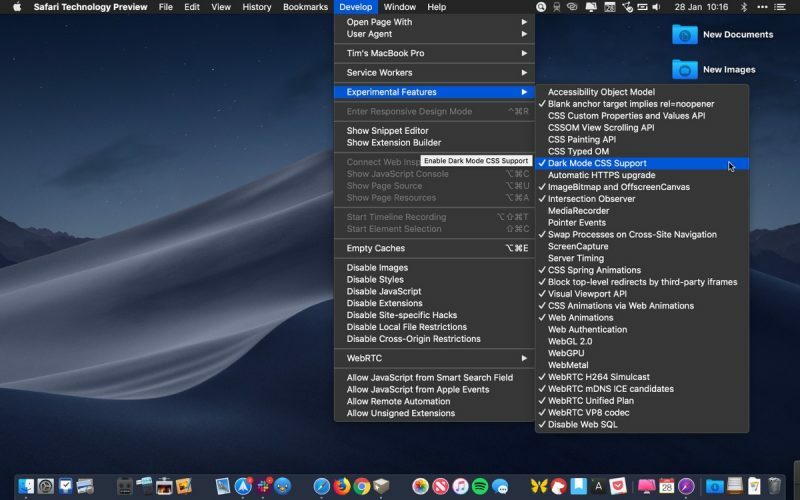 Since the release of Safari Technology Preview 68 in October, Apple has been building support for the use of Dark Mode CSS, which can be enabled via its Develop -> Experimental Features menu. The experimental feature has now also made its way into the latest macOS Mojave 10.14.4 developer beta. macOS Mojave enables users to switch between Light and Dark mode via System Preferences -> General. With the latest macOS developer beta installed, websites that support the new CSS query will automatically adapt their color scheme to match whichever system-wide option the user has enabled. As noted by iDownloadblog, developers running the macOS 10.4.4 beta can test out the new feature by visiting software engineer Kevin Chen's website, which already supports the new Safari CSS media query. Everyone else can give it a spin by downloading the latest version of Safari Technology Preview, which can be run alongside vanilla Safari in any version of macOS Mojave. While this is neat, I can’t see it being widely implemented by websites. I’m a web dev and I feel like unless this becomes a standard across all browsers, we simply won’t implement designs for it. It’s a further cost to our clients (and a pretty major one in reality) and for a single web browser? A web browser that only runs on a single OS? I doubt many companies will be keen to spend money on this. Others browsers will implement support for it as well, eventually. Also, Windows 10 has already got dark theme, so it makes sense for other browsers to have it as well. Chrome and Firefox are already working on it. When it comes to adding support for it and the costs related to it, I think it mostly depends on how big the website is, but for my personal website I added the query for like 5 minutes. I think it is really nice feature and hope to become widespread in near future. Just because you feel like it's "useless", doesn't mean it's the case for everyone else. I don't remember calling it "useless". My point was that it's an additional burden on Web Devs and that translates directly into cost which has to be eaten by someone. And I sure as heck am not eating it. Respectfully, if you're happy with implementing Dark Mode as an afterthought, the 5 minute approach will probably suffice. If, however, you do things properly, you need to consider the aesthetics/UX of the site as a whole and make all the same considerations you would when designing the default aesthetics/UX. Maybe if the site is extremely basic with 95% of it black text on white background, you'd get away with it. The issue is that if users start to expect all sites to work with Dark Mode, you create a huge problem. And if your website already has a dark mode, it's just a matter of automatically choosing it as the default. I think the Mac / iOS specialist sites (MacRumors / 9to5mac etc) and third party manufacturers that specialise in Apple stuff (twelve south, etc) may do this, but as a web dev myself I second twistedpixel8’s comments - unless it becomes a global “dark mode” standard, uptake of this is going to be slow to non existent. Love the idea and the direction. Side note: I hope this points to iOS13 having a dark mode! I think this is awesome, not for every website, but often I find myself enabling the reader view in pitch dark to get away from the brightness. Most likely dark mode is coming to iOS soon. I've been looking for something like this to go with dark mode on my 2017 MBP running Mojave. Is this something that the end user can do right now? If so, can you link a tutorial? I used to do web development myself, so I'm comfortable with CSS. No CSS editing is needed for that one. This one lets you customize the CSS of any website further. For example, I used this addon to invert the NYT logo, because Dark Reader didn't automatically do that. It lets you tweak and customize things even more. There are websites out there that already offer a dark theme you can switch on or off. I doubt it would be that difficult to automate that switch if the theme is in place already, and I wonder if the complainers here really should be ignoring a feature many people would find useful. The work to do this is often just the CSS filter invert property applied to various elements. Can’t wait for Wordpress to add this! It would not be added at the WordPress (app) level, but at the theme level. So it will depend on how many theme designers decide to include it in their theme, which in turn depends on how many browsers support that media query. On the plus side, I am happy to see this handled via media queries, which the designer can control, rather than by an algorithm for automatically inverting colors.